Undermanned and under-resourced bases in the continental United States are the biggest morale trouble spots in the Air Force, Chief of Staff Gen. Dave Goldfein said Thursday. And the first step toward fixing those stateside morale problems lies in rebuilding the service’s end strength, he said at a breakfast with journalists in Washington, D.C. But ensuring those bases overseas are fully staffed and supplied comes at a price — and stateside bases are largely the ones paying it, Goldfein said. The Air Force had been strained over the last decade trying to meet requirements in space, cyber, the nuclear enterprise, and especially intelligence, surveillance and reconnaissance, Goldfein said, while still trying to carry out its missions fighting violent extremists in locations such as the Middle East. Meanwhile, budgets were getting cut, he said, and the Air Force had to cut its conventional airpower and people to balance the books. Air Force cuts overseas tours to ease pressure on airmen. Is your job coming home? Amid growing concerns that repeated deployments may be burning out airmen, the Air Force is taking a hard look at who it sends overseas, whether they’re actually needed there — and if they should come home. The Air Force cut more than 19,800 airmen during the steep drawdown of 2014 and early 2015, until it bottomed out at nearly 313,000 active-duty airmen — the lowest level since 1947, the year it was created as an independent service. But even though end strength dwindled, he said, the number of missions the Air Force was called to perform didn’t decrease. And at some bases, that strain has led to morale troubles. One of the key investments necessary to fixing that readiness and morale problem, Goldfein said, is rebuilding the service’s end strength. The service has already brought its active-duty end strength back up to 325,100, and the fiscal 2019 budget calls for adding another 4,000 active-duty airmen, as well as 700 more Guard and reserve airmen. And in the following few years, Goldfein said he hopes to ”set the throttle” to an annual growth of roughly 3,300 airmen. “That allows us to really get at some of the shortages we have in manpower to do the missions,” Goldfein said. He pointed to the Air Force’s success in whittling down its maintainer shortage from about 4,000 to roughly 200 as an example of progress made. But the Air Force is still struggling to right a pilot shortfall of about 2,000, or roughly 10 percent of its pilot force, including about 1,300 fighter pilot vacancies. Goldfein also said the Air Force also needs a healthy number of weapons systems to generate sorties and sustain readiness at the levels needed to carry out combat missions. That means having the necessary spare parts and depots, making sure the supply chain is working right, and making sure pilots have enough flying hours, he said. But, the Air Force also needs maintainers with enough experience to carry out the more complicated types of repairs and maintenance on advanced planes — and that’s been tricky. Although the Air Force has all but eliminated its maintainer shortfall, the majority of its new maintainers are young and don’t have the 5- and 7-levels of experience necessary to carry out that advanced maintenance work. The service is trying to find ways to train and season its new maintainers more quickly to plug those skill gaps, officials have said. And the Air Force is trying to figure out how to train its airmen to meet the challenges posed by advanced adversaries such as China and Russia. 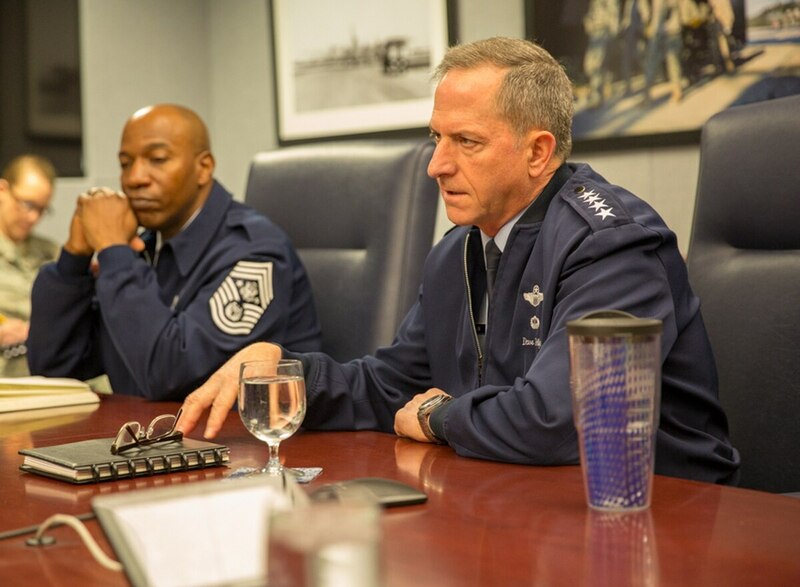 Goldfein said that the Air Force’s proposed budget for next year will allow it to make progress in those areas, which it hasn’t been able to in the past. Goldfein declined to comment on the Pentagon’s new policy that would ban most transgender people from serving, saying the matter is still under litigation. Goldfein said he was not on the panel reviewing transgender policy. Goldfein also said he’s not yet ready to make an announcement on whether or not the Air Force will adopt the Operational Camouflage Uniform for all airmen.